Carl Grimes: I'm sorry about your mom. Daryl Dixon: I'm sorry about yours. "Hounded" is another terrific episode to Season 3, after a hugely promising start to the season. Not as good as the brilliant first two episodes or the equally brilliant "Killer Within", but there is a lot to love. 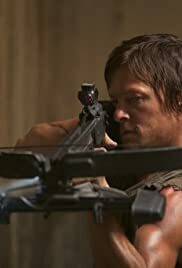 It is yet again a strong reminder of how Seasons 1-5 of 'The Walking Dead' to me were absolutely brilliant and seeing the show in its full glory days (Season 6 was uneven, Season 7 was a huge disappointment and am still debating whether to watch Season 8). It is as emotional, complex and as tense as one would expect, at the same time it has adrenaline and guts. My only complaint of "Hounded" is that at times it is a little too heavy on the talk. Like all the episodes of the show, "Hounded" is incredibly well made in the production values, with gritty and audacious production design, photography of almost cinematic quality, effects that look good, have soul and are not overused or abused and pretty frightening make-up. The music is haunting and affecting, having presence but never being too intrusive. The writing generally is intelligent and thought-provoking, with lots of tension and emotional resonance and shows signs of character complexity and multiple layer storytelling. The more eventful parts are thrilling and terrifying as well as uncompromising. Appreciated the ever strong and still progressing story, where a lot happens and full of different strands without being confused or over-stuffed, and character building, which the episode has a bigger emphasis on, and that the pace is rarely dull or rushed, if not as taut or edge of your seat as most of the previous episodes. The character writing and the character interactions are what is particularly great here, most striking with Rick, while the Governor is wonderfully mysterious and already interesting character and Merle is always great value. Am really appreciating the season continuing to give stronger development to Andrea and Michonne is also interesting. Everything is nicely paced without rushing through the more important parts. The world building is already stunningly immersive and effective. Direction is smart and atmospheric while the show throughout has been strongly acted. Andrew Lincoln is excellent as ever, while Michael Rooker and David Morrissey in support are just as great and Laurie Holden and Danai Guirira continue to hold their own. Norman Reedus' deeply felt performance is one of the episode's highlights.